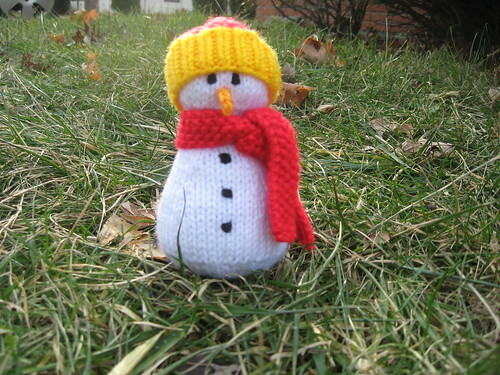 It’s cold, i have lost my knitting mojo, my holiday spirit is waning and things are just tough right now. i know we aren’t the only ones who are having a hard time but it brings you down and it’s scary. In an attempt for some cheer-i did manage this adorable little guy for Little Man’s advent calendar. I love how he turned out 🙂 Just too cute. He is from the Winter 2009 of Living Crafts and its by Chris de Longpré. I just used scraps of acrylic yarn that i had in my sack of remants-some Bernat and Caron Simply Soft. He was knit in the round and went quickly. In the pattern the eyes and buttons were made with French Knots but i just backstitched around the one knit stitch where i placed the eyes and buttons. i hope Little Man likes him as much as i do. The snowman is absolutely the cutest! Little man will love him. Gurl yes this has been a hard year for me overall, and even harder at the end. I will just say I know the one thing I know for sure is just to Trust in God! Truly! !